Many have clearly gone over to the enemy’s side – including some members of our own family. Today, we recall the “commencement” at the end of four years at the University of Vermont. People in the Main Street world work for profits… and are subject to market economics. The professoriate is above it all; no profit and loss statements… no profit motives or incentive bonuses… and (for those with “tenure”) no chance of getting fired, no matter how incompetent, irrelevant, or wrong they are. The private sector depends on output and results; academia harbors gassy hacks who may never produce much of anything at all. The ceremony on Sunday opened with the procession of the university luminati, led by bagpipers of the St. Andrews Society. Ordinary people – even presidents of the United States of America – wear common coats and ties; the academic elite are gussied up with all manner of robes, funny hats, cowls, tassels, honors… and a line of capital letters following their names like baby ducks behind a waddling quack. “All that brainpower… working on our Justin… it must have done him some good,” parents say to themselves. Then, they have their doubts. Justin seems to think that “diversity” is what really matters… that Bernie Sanders has the right idea… and that eating gluten is a sin. Privately, they wonder if they haven’t just been the biggest fools on the planet, spending more than $100,000 to put their boy through four years of brainwashing… with no visible improvement in his critical thinking. At least… those were the dark thoughts gathering in our mind as we sat in a plastic chair on the green, waiting for the festivities to begin. Mr. E. Thomas Sullivan, university president, must have seen the clouds over our head. “Criticism and cynicism will not lead to a constructive solution,” he said, looking right at us. But criticism and cynicism are just what the University of Vermont most lacks. Without them, the Yankees allow themselves to believe any self-congratulatory bunkum that comes along. They say on Wall Street: When everyone is thinking the same thing, no one is really thinking. That’s the problem with the institution of higher learning on the banks of Lake Champlain. If anyone is doing any thinking there, they didn’t let him say anything on Sunday. We’re used to commencement claptrap. The typical graduation exercise is always a mixture of lies, pandering, blah-blah, and flattery. The only redeeming quality is that it is transparently insincere. Whoa… how do you do that? “Who here doesn’t believe that climate change is the most important challenge facing this graduating class?” asked the university president in his opening remarks. Out of thousands of arms, only a couple hands went up. Mr. Sullivan hardly needed to ask. For him and the rest of the jury, no further deliberations were necessary. The verdict has already been rendered. No need for any more evidence, testimony, or eyewitnesses. The matter was settled. There was not a single dissent. Not a single question. If there were any doubts about the difference between good and evil… or who should be elected president… none were mentioned… or how the world works… it was nowhere to be seen. Students were cited for special recognition… awards were given… speeches made… on and on… hour after hour. Every one of them was a world improver. Every one “cared.” And every one of these inchoate idealists had a ticket to government employment. Only one will definitely not find a nest among the zombies – one whose degree was awarded posthumously. “I care, therefore I am,” suggested Gail Sheehy, who gave the keynote address and neatly summed up the event’s leitmotif. “Caring” is all you need to do. You must care about the poor, the excluded, the politically correct victims left behind by modern cutthroat capitalism. Don’t worry about whether caring actually makes a damned bit of difference. Don’t concern yourself whether meddling in others’ lives really helps them. Ignore Adam Smith’s insight… that it wasn’t his love for humanity that got the baker up at 4 a.m. to warm his ovens. Most likely, Smith was right; world improvement is a by-product of trying to improve your own life, not trying to change the world itself. And Friedrich Hayek was probably right, too; trying to improve the world by inflicting your ideas on others does more harm than good. But at UVM, all you gotta do is care! And if you don’t care; you don’t exist. No student was encouraged to bake better bread. None was rewarded for improving the internal combustion engine. Not a single one was recognized for anything that might demonstrably and convincingly make peoples’ lives better. Instead, the caring alumnae leave the university like drunks leaving a bar after closing time… their judgment impaired by the heady fumes of do-goodism. Will the world really be a better place a year from now… or two years… or however long it takes for these “carers” to work their magic? We don’t know. But you’d think that a university would be a good place to at least ask. P.S. On a positive note, our son graduated with a degree in geology… a discipline still untarnished by claptrap thinking. We were the proudest parents in Burlington. 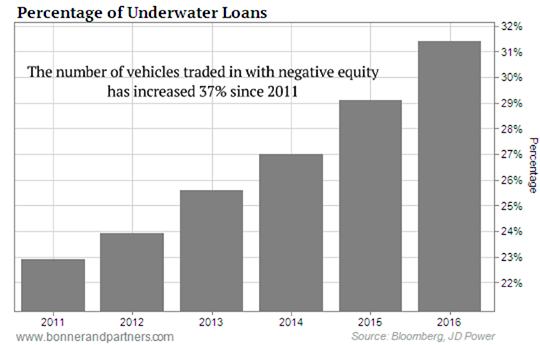 Since 2011, the number of underwater auto loans has grown by 37%. As you can see from the chart below, more than 31% of vehicle trade-ins now have negative equity. In other words, the remaining balance on these loans exceeds the value of the car. There’s a simple skill the world’s greatest investors use to create wealth… including Warren Buffett himself. One market expert says that anyone who masters this skill can safely make a fortune in stocks. The debate over whether college is worth the massive costs rages on. As costs rise and total student loan debt tops $1.2 trillion, many are starting to see college as a financial gamble. The gold market will soon be very different from what we see today. In fact, five current developments in China will soon have a huge impact on gold investors. Can a homemade "beverage" permanently end Alzheimer's disease? That's what experts are now claiming after seeing THIS drink in action. Click here for the full story. Before we get to today’s Mailbag, do you have a “commencement” story you’d like to share with Bill and the team? Write to us at [email protected]. We’d love to hear it. And now… Bill really touched a nerve with last Friday’s Diary, “Bad News From the Ranch.” The feedback continues to pour in as your fellow readers take stances on both sides of this contentious issue. This is happening a lot in Brazil too. Landless people movimento they call it there. All they want is to take something away from someone else, then they flip it and sell to a bunch of peasants or others who build shanty towns and then no one can get rid of them. It is just a bunch of thieves creating ways to take what is not theirs disguised as indigenous or socialist grounds. Hello Bill. Long time reader and admirer. So sorry to hear about the originarios trouble in Argentina. Get out of there before one of those criminals gets crazy. Too close for comfort. We don’t want to lose you! You know Bill the world is ruled by the aggressive use of force. May the force be with you. Hello Bill, I feel like I am right there when you describe the scene on your property. I will be praying everything works out for you and you have a clear deed to the property. Mr. Bonner, I have been receiving your financial information for a few months and I have been very grateful for the information you are sharing with your followers. This information about the invasion at your farm is sad. I am a chaplain and have a very faithful group of folks that pray and I see major changes take place as a result of those prayers. I am sending a request for prayer for you, your family, and your property in Argentina. Please know that those prayers will continue until we hear a favorable change report! “European-style property rights…” Your use of that term in your May 20 letter about the problems you are having on your ranch is very telling, Mr. Bill. The Europeans (i.e. the white man) slaughtered and enslaved native indigenous people, the world over, to steal their land and resources in the name of their own, imagined, superiority and supremacy. The white man’s theft of land and resources, worldwide, was facilitated by one thing: Superior weaponry – the gun. No native peoples possessed firearms, and so they were easy prey for the whites. You say that simply because native peoples’ ancestors once lived on the land (in this case, your ranch in Argentina) gives them no right to that land. I heartily disagree. I dare say that most, if not all, non-whites would disagree. I am absolutely certain that if a bunch of Africans or Australian aboriginals or Native Americans had invaded Europe and stolen the land that the whites had lived on for thousands of years by slaughtering white men, women and children with some form of superior weaponry you would feel differently. You would be an originario. And, don’t pride yourself because some Argentinean authorities or law are on your side. The “authorities,” be they governmental, civil, or religious, always lend their support to those who have money. You have lots of money and those Argentinean laws were cast in the image and likeness of European law, and so we come full circle. I cannot believe the responses to “Revolution at the Ranch.” I can only hope that each of these posters will have someone come and claim any property which they have accumulated with their hard work. For those people who say we “stole” our land from the “native” Americans and we should return it. I would like to know which “native” we return it to. In South Dakota the last tribe that lived in my area were the Sioux, but the Sioux “stole” the land from the Pawnee and the Pawnee “stole” the land from the Crow, etc. Sorry, but to the victor belongs the spoils. I am not sure what is meant by the registered owner of property does not “own” the land. I definitely have ownership rights in that I can sell the land; I can use it, within limits, as I wish, I can restrict others from using it, etc. To me, that is owning the land. I agree that as owner I have caretaker responsibilities, and I think the improvements I have made in the land in the past 40 years attest to that. Sell the livestock, burn the buildings, push the rubble into a hole and cover it, plow the road, and give it back as it was when their ancestors were there (without jobs). Bill, thanks for sharing your stories about the Argentine highland ranch and the challenges posed by the local residents. Great fun to experience a sampling of your life in those parts. Perhaps one day I may be fortunate enough to visit Argentina again, exercise my Spanish, and enjoy a good churrasco and some of that homemade, costly wine you make. I especially enjoy the many letters/replies and advice you receive from others, highly entertaining. All the best to you and Elizabeth. He says, in late 2016, the worst financial depression in history will hit… wiping out the savings of unprepared investors. But for those who see the writing on the wall now, it presents a rare opportunity… a chance to make thousands while this crisis transpires. Doug reveals everything you need to know right here. Should Jesus Have Gone to College?